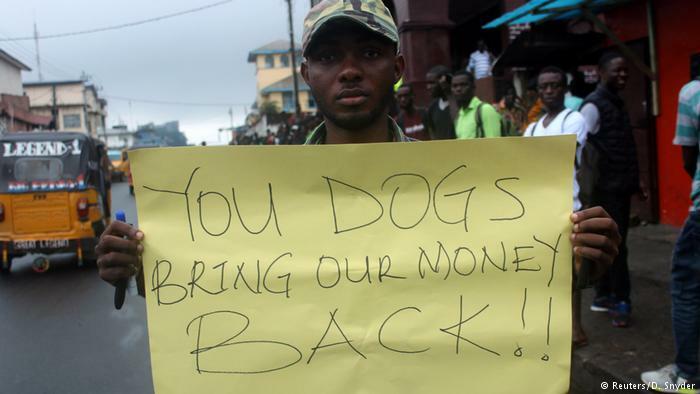 Protestors carried petitions to present to embassies of the United States, the EU and the United Nations in Monrovia Monday, shouting "bring back our money." Containers loaded with Liberian dollar notes worth $104 million (€88 million) printed in Lebanon and Sweden arrived at Liberian ports in November 2017 and August 2018. Last Tuesday, Liberian Information Minister Nagabe told Voice of America that there were no records of the containers being collected. On Friday, Finance Minister Samuel Tweh appeared to back suggestions that the money had not been properly declared. "I am saying there is no missing money. No one is looking for billions of [Liberian] dollars," Tweh told local radio. The supposed disappearance, worth nearly 5 percent of the impoverished West African country's gross domestic product (GDP), led last week to a travel departure ban on 15 people, including Charles Sirleaf, the son of ex-president Ellen Johnson Sirleaf. Protestors on Monday braved a rainstorm and a heavy police presence to deliver petitions to the foreign diplomatic posts. Numerous premises and schools in Monrovia were shut, reported the Liberian Observer newspaper. Protestors chanted: "George Weah, act now," with some asserting that the recently elected football star turned president had been behind the apparent theft. In March, Weah had said he had "inherited a country that is very broke, depleted by political malfeasance." Liberian Central Bank Governor Nathaniel Patray said Monday the institution was cooperating with investigators after submitting a request to the US government. Amos Tweh, former youth wing chair of the former ruling Unity Party, told the media outlet Front Page Africa, that Weah's government must account for the loss, put at 16 billion Liberian dollars. "We cannot go to other countries lobbying for [more] money," said 21-year-old political activist James Zeah. The Liberian Observer said Weah, 51, with his entourage, was visiting the UN General Assembly in New York – his first as head of state since being elected by a landslide in December last year. Weah would meet with US investors and visit the Westpoint Military Academy, the Observer said.